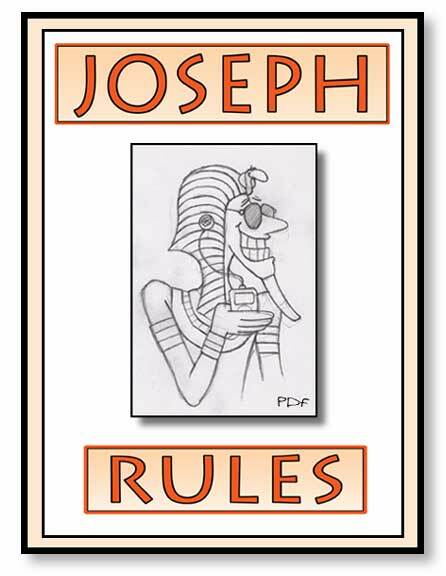 Bible Stories for Kids - Joseph Rules! ...clapped his hand on Joseph's shoulder, Where in all of Egypt could I find a wiser man than you! Surely the Spirit of God is with you! Pharaoh said, I will put you in charge over my house and all the land of Egypt. Wouldnt that be fun! Whatever you asked for, someone would do. Thats why only a very WISE person should have that kind of power. Otherwise you might be commanding things like, Bring me three dancing bears! or Fill my pool with butterscotch pudding! and goofy stuff like that. But Joseph WAS very wise. He listened to God, and only did what pleased him. And then he had Joseph dressed in the finest royal robes, and he put a gold chain around his neck. And to think, just the day before Joseph was wearing a whole different kind of chain, sitting in the dust and dirt of a dark prison floor. How quickly things can change when God is at work! When things are bad, and it seems like nothing but troubles, you just never know what surprises God has waiting. And so Pharaoh made it known throughout all of Egypt that Joseph was in charge. Then Pharaoh gave Joseph a new name. And you only GIVE a name to someone who is very close and dear to you. So Pharaoh gave Joseph a new Egyptian name, Zaphenathpaneah, which of course is much too long to keep having to say over and over in this story, so well just keep calling him Joseph. But in the eyes of Pharaoh and all of Egypt, Joseph was Zaphenathpaneah. He had been accepted as one of their own. Joseph was just 30 years old when he was made a prince of Egypt. After all that Joseph had been through, all the ups and downs, all the troubles, look where God had put him! ...for the next seven years the rains came, just as God said they would. The crops of Egypt grew and grew, and when each harvest came, Joseph did just as God told him to. He went all around Egypt gathering up the overflowing food. In each city he gathered up the food from the fields around it and stored it up in barns for the years of famine that were coming. What a valuable lesson to learn! You can be as wise as Joseph. For most people, there will be good times - and there will be hard times too. When times are good, and God blesses you with more than you need, dont go crazy and use it all up as fast as you can. Instead, save some of it. Set it aside, and then you will be ready when hard times come. Thats just what Joseph did. God blessed the land so richly, that soon there were mountains of grain. It was like the sand of the sea. There was so much, that Joseph finally gave up even trying to measure it all. It was truly beyond measure. And then one day the rains stopped.